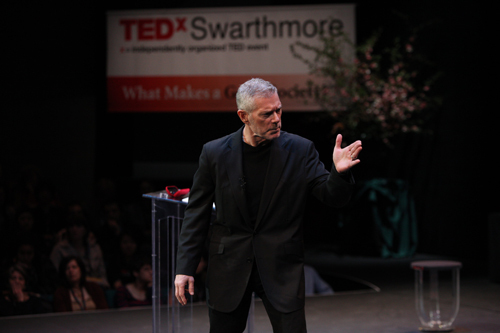 Stephen Lang '73 (left), earned audience accolades for his speech at the College's recent TedxSwarthmore event. TED is known for its programs featuring diverse and paradigm-challenging speakers who discuss “ideas worth spreading.” TEDx events are hosted by institutions or geographical regions and also feature compelling content, are live-streamed, and ultimately live on indefinitely on YouTube. The College event surpassed even those with the highest expectations but not without extraordinary pre-event planning by student volunteers and dozens of College administrators. Four students—Michael Xu ’12, Walker Stole ’12, Julia Karpati ’13, Nimesh Ghimire ’15—formed the nucleus of the student planning committee. This was not the first TED experience for Ghimire. “I got the license to host Nepal’s first TED-inspired event, TEDxKathmandu, which we organized in July 2011, a month before I joined Swarthmore,” he says. 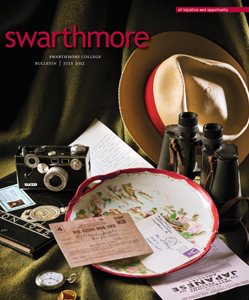 To ensure that the College’s program could launch here, the students enlisted another Swarthmore TED expert. Barry Schwartz, Dorwin J. Cartwright Professor of Social Theory and Social Action, has given several TED talks in Long Beach, Calif., Oxford, England, and Amsterdam, among other venues, and is a featured speaker on the new NPR program TED Radio Hour. “I co-taught a class [on campus] with [William R. Kenan Jr. Professor of Political Science] Ken Sharpe, and afterwards, Michael [Xu] and Walker [Stole] asked about possibly getting a TED event at Swarthmore,” Schwartz says. As he well knew, it wouldn’t be a snap. The TED organization has a set of very detailed, specific requirements that individual events must meet in order to be granted a license. The students next turned to the College for operational and financial support. After the students’ had garnered the support of the College, Nicely led a group of campuswide colleagues, including the student organizers, to consider every detail of TEDx. The group met frequently for seven months beginning in September. The event proved a major success in several ways. The Lang Performing Arts Center was packed, and 500 other spectators watched the talks livestreamed to Sharples, Science Center 199, the College Bookstore, and around the country and world. There was furious Tweeting throughout the day, and the lobby was buzzing with conversation in between speaker sessions. Two of the speakers addressing the question “What Makes a Good Society?” were Mary Jean Chan ’12 and Schwartz. Chan won the TEDxSwarthmore Student Challenge, competing with a half-dozen other students to speak at the event. In her talk “A Tapestry of Narratives: Conversations through Poetry,” Chan discussed the idea that “genuine discourse and dialogue may seem like a very simple thing, and it often does yield more questions than answers, but … is a crucial piece in furthering our daily attempt at building a better society.” Among other ideas, Schwartz discussed an issue personally relevant to every Swarthmore student—college admissions. Other speakers were President Chopp; Professor of Economics Mark Kuperberg; Associate Professor of Statistics Steve Wang; Stephanie Nyombayire ’08, co-founder of the Genocide Intervention Network; actor and playwright Stephen Lang ’73; Professor of Linguistics Donna Jo Napoli; founder and CEO of AnthroTronix Cori Lathan ’88; Paul Starr P’13, professor of sociology and public affairs at Princeton University; Professor of Biology Amy Cheng Vollmer; and Associate Professor of Music John Alston. Associate Professor of Sociology Sarah Willie-LeBreton moderated the event.